15% of the population is now self-employed – that’s massive! And social media as a marketing tool has definitely played a big part in this meteoric rise, only set to grow and grow. But social media also has its downsides. There is a rumour that Facebook is launching a tool to help us manage our time there. Executives in the world of social are worried they have created a monster, banning their children from social and Facebook itself acknowledged that social media can be bad for people’s mental health. I also saw a post (on Facebook, ironically) that said that using tech and computers is actually damaging our brain function and memory in a way that is irreversible! But, it’s convenient. It helped with the uprisings in North Africa, it gives us news faster than ever before (sometimes fake! ), it’s bought together whole communities of people, it helps us stay in touch and it supports us to build our business. But what if you’re looking to build your business the old-fashioned way? What then? Honestly, meeting people and networking is the number one thing that has built my business. Well, that and social media. But meeting people has given me networks, people to collaborate with, people who champion my work, pay me and recommend me to others. There are so many opportunities to meet people these days, from Linkedinlocal meetups, to traditional networking, the co-working spaces, to conferences, to just chatting to people when you are out and about. Try out a few, the first one you go to might not be your cup of tea, but don’t let that put you off. And if you can’t find something you like in your area, chances are there are other people near you feeling the same way. So start your own, that’s what I did with Blue Stockings and First Tuesday. Find a venue and tell people about it, start small and grow! Have you got old clients you haven’t see for a while? Leads that went cold? Why not pick up the phone and have a chat. Start from a place of giving, how you can help them, who knows where it will lead! Good old-fashioned PR. How can you get your name out there quicker than meeting everyone – get on the radio, in your local paper, the nationals or magazines! Make a list of where you’d most like to feature. Get to know the person who writes about similar things, get in contact with them with a story and see how it goes. Also, keep an eye on twitter for #journorequest and #prrequest. There are journalists looking for you right now! I’ve been in the Ecologist magazine picked up as a Natwest business advisor by replying to requests. I also know someone who got in Forbes – imagine what they exposure could do for your business. Now, this is very 1980’s, but it might just be the right fit for you. But remember location, location, location. And make it right nice! Your customers are amazing. If they think you’re great, they might just tell their friends! Could you give them and their friends a discount for the referral? Word of mouth is the best form of marketing, so give it some lubrication! We all love something arriving in the post! Could you send a letter, gift, postcard to past customer letting them know how much you appreciate them and give them a little something with it? Not my favourite thing. I tend to throw them away. But if you made lovely ones on nice paper or card people might just keep them. Hand them out, give them to people, let them know what you do. But please again, good quality print. We don’t want to give the impression we don’t care – so no Vistaprint! 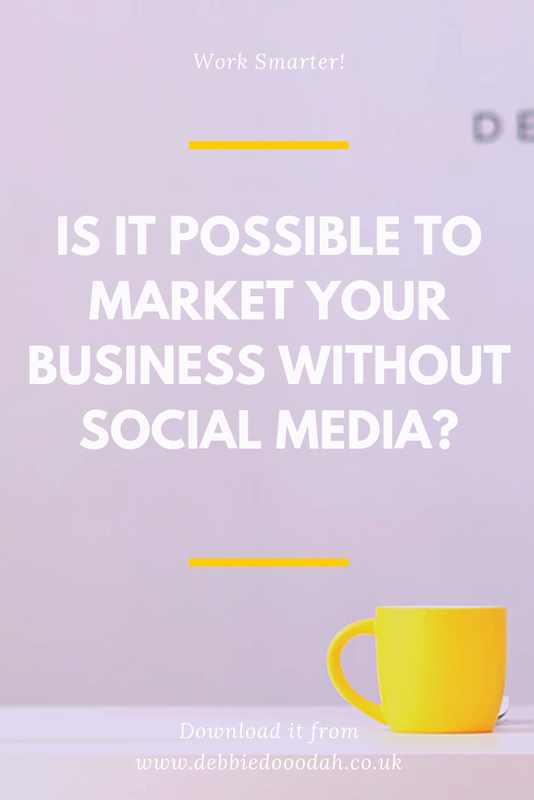 Have you got any other ideas around how you can market your business without social media? I’d love to hear them! Get in touch with me @debbiedooodah everywhere! Oh yes, that’s social media! Older Post7 ways you can have a happy hustle!